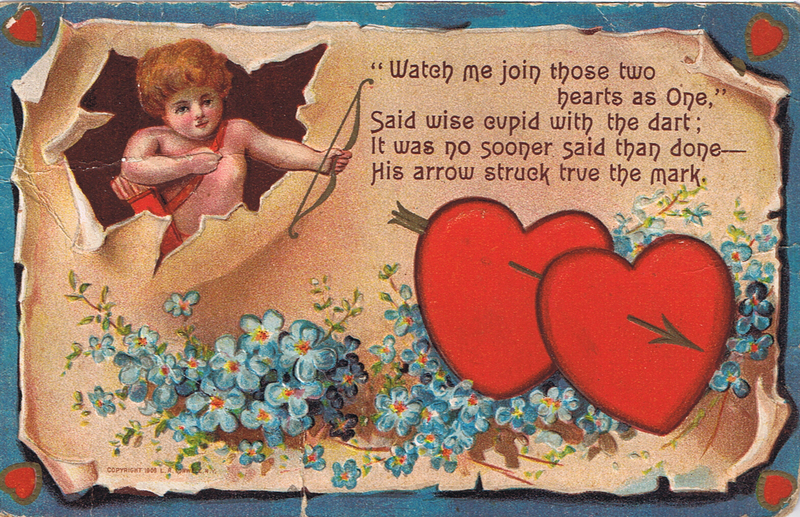 This image depicts a vintage Valentine's Day postcard, circa 1910. Have you ever wondered about the origins of Valentine's Day? Although its beginnings are not exactly clear, historians believe the oldest surviving card—from 1415—is in the British Library. Charles, the Duke of Orleans, wrote the letter to his wife when he was a prisoner in England’s Tower of London (after he was captured during the deadly Battle of Agincourt). When postage rates became affordable, people began to send Valentines without signing their names. Some of those anonymously sent cards contained risque verses, leading some countries to ban the practice of exchanging them. 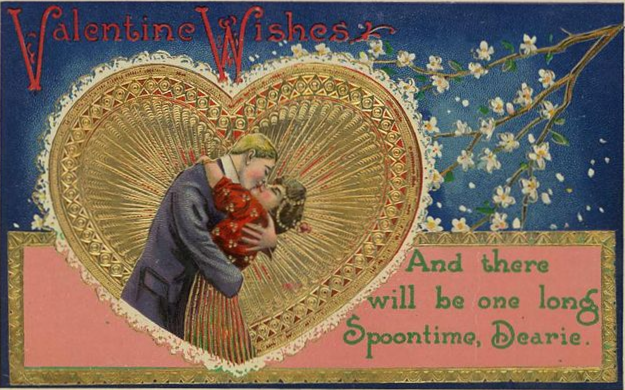 It is said that in the late nineteenth-century, the Chicago post office rejected thousands of Valentines because they were too inappropriate to be carried by the U.S. mail. Even in the 21st century, Valentine's Day has been discouraged (in India and elsewhere), banned in the city of Islamabad (in Pakistan) and banned altogether (in Saudi Arabia). So ... what do we know about the actual roots of this day of love? Some of the stories are about as risque as those cards which the post office refused to deliver. We won’t go there, except to say that between the 13th and 15th of February, Romans (during ancient times) celebrated a feast involving match-making. Then ... in different years, during the third century, the Roman Emperor Claudius II (known as "The Cruel") executed two men named “Valentine,” on the 14th of February. That is likely the source of the holiday’s name since the Catholic Church, honoring both men as martyrs, began a celebration known as St. Valentine’s Day. In the 5th century, the Normans (who lived in the country known today as France) celebrated an event known as Galatin's (“lover of women”) Day. Perhaps that became confused with “Valentine’s Day” (because, among other things, the two words sort-of sound alike). Dr. Chris Fletcher stumbled-upon that document, in 1999, while looking for interesting exhibits in a pile of papers. Men still shy away from commitment, women still take care of the nitty-gritty of wedding arrangements - and a girl's best friend is her mum and has been for over 500 years. Shakespeare helped to associate Valentine’s Day with romance, and the fun of exchanging handmade cards spread throughout Britain and Europe. As the Industrial Revolution grew in scope, spreading to the “New World,” handmade cards gave way to factory-made cards. Many Victorian-Age Valentines still survive. Then, in 1913, the world of Valentine’s Day changed forever when a company in Kansas City, Missouri (called “Hallmark Cards”) began to mass-produce Valentines. Now ... Valentine’s Day is a hugely commercialized affair. People throughout the world spend billions of dollars (collectively) on flowers, chocolates, jewelry, dinners (and other sorts of remembrances which say “I Love You!”). It’s always nice, though, to receive handmade cards. They just seem to convey more tender thoughts and feelings, don’t they? Bos, Carole "Valentine's Day and Its Origins" AwesomeStories.com. Jan 29, 2015. Apr 21, 2019.